Write-on expanding file jackets help you divide, organize and color code projects. Add some color to your office files with these unique file jackets. The write-on expanding file jackets help you divide, organize and color code projects. Designer v-cut front provides easy access to documents. Featured write-on areas make it easy to provide details regarding the contents of the file jacket. The full-length tab and lined front panel area feature write-on technology for easy identification and organization of folder contents. Works with pencil, ball point pen or permanent marker. Sealed on three sides with 1 inch expansion. Letter size. Acid-free polypropylene. Assortment includes 2 each amber orange, lime green, charcoal gray, raspberry red, steel blue. Hi, I'm Jen at C-Line and today we're going to talk about Colored Write-On File Jackets. Divide, organize and color code projects with these file jackets featuring C-Line's new, sophisticated and fun color palette. The full length, tab and front panel feature write on technology to easily identify what's in your file. Simply use a pencil, pen or permanent marker to label your file jacket. These colored file jackets are sealed on three sides and feature a one inch expansion to hold up to 200 pages of information. They are made from archival quality polypropylene and fit letter size documents. Use them to organize files and information for your home, school or business. 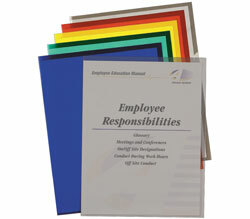 Get organized and easily identify projects with our Colored Write-On File Jackets. Order yours now. That's all the time we have today. I'm Jen at C-Line and thanks for watching.